This volume is the definitive collection of the best science fiction novellas published between 1929 and 1964, containing 11 great classics. No anthology better captures the birth of science fiction as a literary field. Published in 1973 to honor stories that had appeared before the institution of the Nebula Awards, The Science Fiction Hall of Fame introduced tens of thousands of young readers to the wonders of science fiction and was a favorite of libraries across the country. ©2018 Blackstone Audio, Inc. (P)2018 Blackstone Audio, Inc.
Hall of Fame, no doubt. I'm an avid reader (60yrs old w/3k+ books behind me) so here in my going-on 'golden years' I've begun adding audio books to my daily commute. Should have done it LONG ago. Duh. But the pleasure is greater, I suppose, and this title in particular took me for a ride in the WayBack machine. Yes, I DO remember the '60s; when sci-fi made you think. Hall of Fame, Vol. 2-A has several of the best titles from that or any era. And FYI? If you're familiar with the movie 'Idiocracy' (loved it, HIGHLY recommend it) the plot was clearly stolen from Cyril M. Kornbluth's 'The Marching Morons'. I wouldn't bother mentioning this, but the movie credits gave no credit... and that ain't right. Get this audiobook (and the others in the series). Listen... and learn. 36 sur 38 personne(s) ont trouvé cet avis utile. The stories are among the best there are. No debating they, if you're a sci fi fan. The narration is usually fine, but some stories have odd moments. Like when the character is East Asian... The worst example of this is in the story "Nerves", where the exposition describes a Japanese man as having almost no accent, then when the man speaks it's on the worst caricature of a Chinese accent. There are also a couple moments when narrators mispronounce words. But aside from those two weird problems, it's really a good listen! 17 sur 21 personne(s) ont trouvé cet avis utile. Loved hearing this on the way to work. The narration really draws you into the stories. 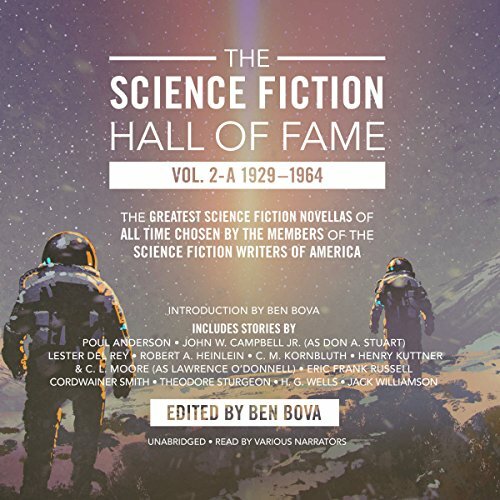 The stories collected here show what science fiction was. Some still hold up, some don’t. They are all though, a chance to travel in time—not to the future, but to the past. The world they present is that of America (mostly) before the 1960’s. The futures they imagine are hardly more different from our present! Solid readings of key pieces of old scifi. I must admit, I could have done without "Who goes there", for it felt unnecessarily convoluted and hard to follow, but even so, the premise is good, so I can't really complain too much. "And then there were none" and "Universe" are probably my favourites of the bunch. This has some great stories. I had read most of them before, but it had been some time since I had read most of them. They are superb examples of early Sci-Fi. The last story is, in my opinion, the best story to show that any extreme is bad. I think most of the concepts in these stories are beyond children, but I recommend this book for all adults. It might even make you stop and think. Excellent narration, but some awful scifi. Worth it for HG Wells alone. I found that there were only 2 or 3 halfway decent stories, but most if them were aggravtingly cliche, boring, or juvenile. Tremendous Value! Great way to explore sci-fi. The stories are indeed worthy of the hall of fame status. Great content and performed earnestly across the multiple narrators.